If you’ve spent any time in an arcade or in front of a television playing video games, you’ve seen some incarnation of the health meter. Critical Hit! Collectibles has taken the life bar version and turned it into a necklace that actually glows. 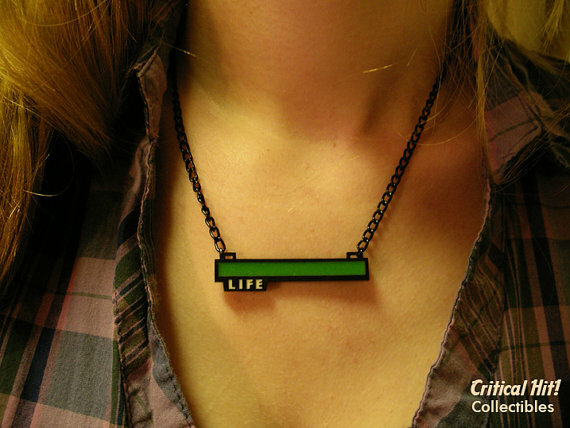 They offer their “Glowing Life Bar” necklace in a full version (pictured above); as well as “Mostly Dead” and “Mostly Alive” versions, which are partially depleted. You can also request different chain lengths that determine where it falls on your neck. All this customization will only set you back $16, and can be purchased from Critical Hit! Collectibles Etsy shop.